Based on reviews from 19 experts and 67 users. Learn how our rankings work or see our guide to Paul George basketball shoes. Updated Apr 2019. Upon the release of the first Paul George shoes in early 2017, the basketball star officially joins Lebron James, Kevin Durant, and Kyrie Irving in Nike’s elite circle of signature athletes. He is only the twenty-first to be exalted to such a prestigious and extravagant position. His rise to this elite circle is not easy to decipher. It came at a time when the performance basketball shoe industry is experiencing a steady decline. Logic dictates that the next wise move for Nike, or any other brand for that matter, is to limit investments in the field. But the contrary becomes true. Paul George’s signature line is launched a little over a year after Nike and LeBron James signed a $1 billion lifetime deal, which itself came a little over a year after Kevin Durant bagged a $300 million ten-year extension with the brand. These mammoth deals ensure the continuity of Kevin Durant’s signature collection and LeBron James’s numerous lines. But why did the company choose to honor Paul George with Nike basketball shoes? Paul George is a lesser star than Lebron James and Kevin Durant, and even Kyrie Irving who rose to signature shoe prominence only in 2014. But analysts say that it this very fact that made Paul such a wise pick for Nike. The lesser glimmer of Paul George’s star is the freshness that the brand needs. LeBron and Durant’s celebrity means heftier paychecks, which translate to higher prices for their signature kicks. In a market that’s slowly losing interest, high-priced offers are not really the way to go. So, in a way, Nike needs Paul George as much as he needs them. All he needs to deliver in order to sustain the interest in him and his Paul George basketball shoes is a promise of NBA greatness, which he is pretty much able to serve satisfactorily. Aside from being a money-saving measure, picking Paul also allows serves another marketing purpose. He is an athlete that many can very much relate to. Even though his is still a success story, it is peppered with several ups and downs that resonate so well with many. Through him, Nike brings itself closer to the balling community without losing their revered position in both the game and the market. They are represented still by a tremendously promising star, but he is one whose athletic backstory isn’t as shimmering or clear cut as the ones before him. Paul George is born to a family of athletically inclined individuals. 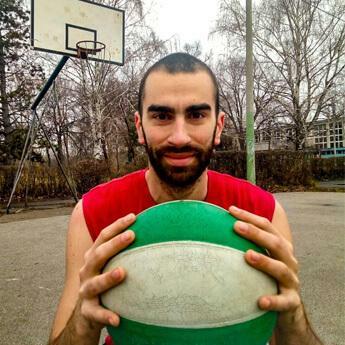 He has two elder sisters; one played college basketball while the other played volleyball. Although he did not play organized basketball early, he was still able to do good when he finally did. During his sophomore year in Knight High School in California’s Palmdale neighborhood, he was already part of the school’s varsity team. In his junior year, he was the only non-senior in the team’s starting lineup. As a senior, he lead his team to the Golden League Championship. He was also hailed as the Golden League’s MVP. Even with these achievements, Paul George still did not make it to the list of the top prospects for college sports scholarships. A prominent college football and basketball recruiting website even tagged him as a three-star recruit. Still, he got offers from schools like Santa Clara University, California State University at Fresno (Fresno State), and Pepperdine University. He eventually settled with the Fresno State reportedly because of their offer of longer play time. True enough, he led the Western Athletic Conference (WAC) in terms of the number of minutes played (at 1176) by the end of his freshman season with the Fresno State Bulldogs. He was a starter in all his 34 games. On average, he made 14.3 points, 1.7 steals, 2 assists, and 6.2 rebounds per game. In his sophomore season, he was hailed by Sports Illustrated as one of the most entertaining athletes to watch in college basketball. Unfortunately, he got injured in January 2010 while participating in the WAC Tournament. When he returned in February, he dumped his career-high 30 points on New Mexico State, leading the Bulldogs to victory. By the end of the tournament, his record shows an average of 16.8 points, 2.2 steals, 3 assists, and 7.2 rebounds per game. The Bulldogs failed to clinch any championship title in the two years that Paul George was with them. In March 2010, Paul George announced that he’s going to cut short his college basketball career and declared his participation in the March 2010 NBA Draft. Paul George officially became a professional basketball player when he signed his rookie contract with the Indiana Pacers on July 1, 2010. He was selected tenth overall in June 24’s NBA Draft. His entry to the NBA held a lot of promise as he became the highest draft pick in the history of Fresno State’s basketball program for men. This alone tells so much about the skill that he has. His performance during his rookie season did not disappoint. He was a starter in 19 of the 61 games that he played. He also stood as his team’s leader in terms of steals per minute, proving that he is a reliable player on defense. His skills that complemented so well those of his teammates brought the Indiana Pacers back to the Playoffs for the first time since 2006. They, however, fell to the Derrick-Rose-led Chicago Bulls in the first round. By the end of the season, he was named to the NBA All-Rookie Second Team. After having proven his worth, Paul George moved on to be a starter in all 66 games of the Pacers second. He dumped a whooping 30 points on the Dallas Mavericks in early 2012. The Pacers once more advanced to the Playoffs and managed to beat the Orlando Magic, which was missing basketball star Dwight Howard, in the first round. They fell to the Heat in the Eastern Conference Semifinals. His third season with the NBA brought one major change. He was made to assume the small forward position in the absence of teammate Danny Granger, who had to miss almost the entire season due to a serious knee injury. The role change proved to be beneficial for Paul. For one, he got to exhibit his exceptional skills for basketball offense. In November 2012, he made nine three-pointers against the New Orlean Hornets (now Pelicans), setting a new record for his team. He eventually finished the game with a contribution of 37 points, a new career high for him. He made his first triple-double against Michael Jordan’s Charlotte Bobcats (now Hornets) in February 2013, victoriously ending the game with 23 points, twelve rebounds, and twelve assists. These achievements might have been the basis for his election to the 2013 All-Star Game, which is another first in his career. He was also named as the NBA’s Most Improved Player for 2013. Paul George’s takeover of the small forward role also delivered fair achievements to the Pacers. They not only made it to the Playoffs once more, but they also advanced to the Finals where they faced the Miami Heat. They eventually went home as the conference runner-ups after a series of alternate wins and loses. As a fitting close to what had been a fairly successful campaign, Paul George was named to the NBA All-Defensive Second Team and the All-NBA Third Team. This is, indeed, an extraordinary feat for someone who had been in the league for only three seasons. The 2013-2014 Season picked up the momentum set by the previous one. Paul George was declared the Eastern Conference Player of the Month for November after leading the Pacers to a 15-1 start-of-the-season record. In early December, Paul set a new career-high 43 points in a match against the Portland Trail Blazers. With a 56-26 record, Paul and his team advanced to the Playoffs. The Pacers knocked the Atlanta Hawks and the Washington Wizards in the first two rounds to face the Miami Heat once more in the Eastern Conference Finals. Unfortunately, the Pacers again fell to the Heat after six games. Even so, Paul George will still look back to this season with a smile on his face because in addition to the Player of the Month title, he also got selected once more to be part of the All-Star Game. He was also named to the NBA All-Defensive First Team and the All-NBA Third Team. Topping it all is his being part of the 19-man pool where the official 12-man Team USA will be sourced. The team was to represent the United States in the 17th FIBA World Cup in Spain. In August 2014, tragedy struck as Paul was participating in a scrimmage at the Thomas and Mack Center in the campus of the University of Nevada, Las Vegas. That game would help determine who were going to be part of the national roster. It is hard to believe but Paul had still not contributed any point to his team–which had Stephen Curry, Anthony Davis, and Derrick Rose in it–even if it was already well into the second half of the game. He knew that it would not be good for him, especially that less celebrated players were making far more significant contributions than him. He’s a star, but Team USA would admit only those who concretely prove themselves in its tests. Determined to make an impression on the evaluators, Paul George attempted a block on James Harden as he approached the ring for a layup. Paul came swiftly from behind Harden, and commentators could be heard saying that Paul’s going way too fast for his own good. The block attempt failed. It was even called out a foul by the referee as Paul George landed awkwardly on the stanchion. “Why can’t I stand right now? Then I saw my bone. The second I saw my bone I lost it. I just laid flat,” Paul recalls. The whole arena was in shock. Paul George just got himself seriously injured in front of everyone’s eyes. The game was rightfully stopped, and he was carted away to the nearest hospital. He was diagnosed with an open fracture of the tibia-fibula in his right leg, an injury that normally takes at least a year to fully heal. But with persistence and perhaps the extraordinary healing power of the type of body that he has, Paul was already in the weight room by mid to late September. By February 2015, he was already able to do full-contact half-court drills. By April, he was already back on court. Greeted with “WELCOME BACK PG” signs by fans, Paul George showed up a renewed player with his jersey number changed from from 24 to 13. He played in the Pacers’ last six games before they finally bowed out of the 2015 Playoffs. People will always argue, but this failure to reach the Playoffs only shows just how difficult it was for Indiana Pacers at that time to lose someone as strategically important as Paul George. The 2015 offseason heard Paul George expressing interest to pursue once again a Team USA spot, this time for the 2016 Summer Olympics in Rio de Janeiro, Brazil. He says that playing as a representative of the United States is a personal goal. He was quoted saying, “I won’t let injury …injury is a part of the game. The last thing I’ll do is let that keep me from making the dream happen. No hard feelings towards none of the situation.” He eventually joined the likes of Klay Thompson, Draymond Green, and Team USA veteran Carmelo Anthony in the Olympic basketball roster. Together they worked hard and won the gold for the United States. Back in the NBA, Paul George was slated to switch roles again, this time from small forward to power forward. This did not push through because Paul is reportedly uncomfortable with the new role. The tactical confusion, however, did not stop Paul George from making huge strides in the regular 2015-2016 season. In 51 of the 81 games that he was part of, he scored 20 points or more, including the 48 and the 40 that he dumped on the Utah Jazz and the Washington Wizards respectively. Largely because of this, the Indiana Pacers became the seventh seed for the Playoffs. They, however, failed to go past the Toronto Raptors in the first round. Reportedly, the Pacers’ failure to get past the Raptors was where Paul George’s frustration with his team started. It is true that the players in the Pacers’ roster were fine in their own ways, but that was exactly where their woes start. Basketball is a team sport, and even the brightest of stars will grow dull if they are not in synch with their team. The situation prompted Paul George to further say that while he is still committed to win a title with the Pacers, he still couldn’t commit that he will re-sign with them when he becomes a free agent in 2018. This statement made the Indiana Pacers a bit uneasy, and they started initiating talks to transfer Paul to other teams in exchange for potentially valuable players. Paul George is good, there’s no doubt about that. In fact, he had been a major force behind whatever the Pacers had achieved. But that didn’t mean that he’s irreplaceable. If he can’t commit to stay, the team might as well get the best out of his departure by trading him. This utter lack of “trust” and “chemistry” became more apparent when the Pacers started the 2016-2017 Season with 15 wins and 18 losses, a record that is understably difficult to bounce back from. Despite all the lingering frustrations, Paul George made a resolve to give it his all. Even with all the drama, the Indiana Pacers made it to the Playoffs as the seventh seed of the Eastern Conference. However, they faced and got swept by the Cleveland Cavaliers in the first round. This only increased Paul George’s frustration, and the animosity between him and the Indiana Pacers grew. Ultimately, in July 2017 or shortly after the NBA Finals, Paul George was shipped to the Oklahoma City Thunder in a trade that brought Victor Oladipo and Domantas Sabonis to Indiana. In OKC, Paul George joins Carmelo Anthony and 2017 regular season MVP Russell Westbrook. Analysts say that while OKC has in its hand a rare combination of top brass talents, making them work in synchrony will be a huge challenge. This may have been true because the 2017-2018 Season saw the Thunder inconsistently performing. Significant wins are often followed by strings of losses. Even so, OKC made it to the West Conference Playoffs but they fell to the Utah Jazz in the first round. As mentioned in the introduction, Nike’s collection of Paul George basketball shoes was launched in early 2017, toward the end of Paul George’s tenure with the Indiana Pacers. It is currently growing and making strides in terms of sales. It has two major releases, and each will be discussed in detail in the subsections below. Taking a little more than three years to complete, the first wave of Nike PGs reflects the duality of Paul George’s personality. “He’s this down-to-earth guy from a small town, but he’s also this red carpet, bright lights kind of dude,” lead designer Tony Hardman says. He is someone who drives a Ferrari but brings with him a fishing rod in case he finds a good spot to fish. His love for fishing is one thing that he takes after his father, and this small-town hobby is prominently referenced by the scale-like design of the shoe’s traction pattern. 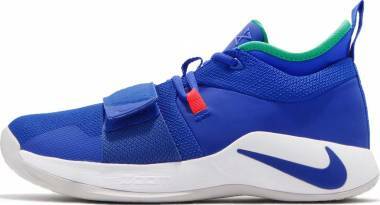 These low-top shoes for basketball prominently feature the “PG” bowtie logo on the tongue. The logo’s form is an obvious reference to the sophistication that comes with Paul’s current status as an NBA celebrity. The straightforward “P” and “G” on both sides of the bow symbolize how easy it is to relate to the player. He is geeky with his love for his video games. He is laid back as evidenced by his love for fishing. He is a father so devoted that the medial side of the left Paul George shoe has “5-1-15,” a direct reference to the day his daughter Olivia was born. He is basically just as human as anyone reading this. Technology-wise, the shoe has a Zoom and Phylon combination in the midsole. This delivers just the right amount of responsiveness and impact protection. The midfoot strap is attached to sturdy Flywire cables that help ensure a secure lockdown. At $110, these Paul George shoes are really worth every penny. Paul George’s trade to the Thunder was heavily criticized, with many thinking that the Pacers front office could have done much better. The criticisms subsided only when the post-PG Pacers fared as well, even statistically better at some point, as OKC. Both teams advanced to the Playoffs but failed to go past the first round of eliminations. This led some to conclude that Paul George and his new team’s performance had been mediocre at best. However, Nike appeared to have had a different opinion. Midway through the season, in January 2018, the company released the second Paul George shoes with much fanfare. It debuted in what the brand calls as the “Playstation” colorway, which directly references Paul George’s almost geeky love for gaming. Paul George just wants to tell stories. He wants his contributions to be not limited within the four corners of the court. He wants to reach out to an even larger audience. It’s just a good thing that he has a good team that supports him. “We have a color team that is really good at what they do,” Hardman shares. “They’re really good at finding the stories that Paul wants to tell. Some of it is just stuff that we know from reading about Paul or things that he’ll say in the meeting. So we bring that back and the color team just goes crazy. They’re able to just keep bringing it.” As a result, the second pair of Paul George basketball sneakers also came in out in many other renditions aside from the much celebrated Nike PG2 Playstation. Even with this pronounced emphasis on aesthetics and cultural relevance, performance concerns were never really put at the backseat. After all, the Nike PG2 is a basketball shoe, and it will have to deliver on-court no matter what. To ensure that it does, Tony Hardman and his team increased the size of the Zoom bag at the forefoot. They also removed the foam above and below it so that the wearer will really be standing on the Zoom unit: a setup that is expected to enhance the shoe’s responsiveness. The Nike PG2 also gets rid of the strap that defined the first Paul George basketball shoes. In its place is what Hardman calls the “dynamic wings,” a feature that he and his team came up with after a conversation with Paul. “And then it was, ‘Hey, don’t put on a strap and I want a regular tongue. Let me see what you got.’ It was really just a process of actually just designing a few things, bringing it to him, letting him check it out,” Hardman relates. 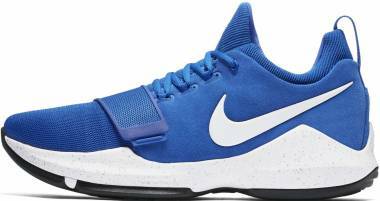 At $110, the Nike PG2 is indeed a worthy companion on-court and even off it. These Paul George basketball shoes are always worth the try. Too many have questioned if the Nike PG 2.5 is simply just the same as the PG 2. Somehow yes. Bringing in the elements from the PG 1 and PG 2 comes the birth of the PG 2.5. First debuted by Paul George in June 2018, his royal blue pair comes with a white midsole and outsole. Its teal inner sleeve and bright red lace loops give these Nike basketball shoes a low-key contrast of color. Depending on the colorway, the upper of the PG 2.5 comes in either mesh and suede, or mesh and synthetic leather. As for the cushioning, the shoe comes in the same forefoot Zoom embedded in a Phylon carrier midsole. The outsole of the 2.5 is identical to that of the second Paul George basketball shoes. It features the full-length flower-esque traction pattern. This improved traction has pistoned zones for flexibility. The PG 2.5 carries the customizable forefoot strap of the first Paul George signature model. The padded inner sleeve and sockliner deliver the comfort needed during play without compromising responsiveness and court feel. For ultimate support, the midfoot comes with Flywire technology and outrigger. Aside from the basic and team colorways, Playstation collaborated with Paul George and Nike for the second time to create the PlayStation x Nike PG 2.5. The Wolf Grey colorway was released on December 1, 2018, the Royal Blue on December 27, 2018, and the White on January 5, 2019. And just like the previous models, the PG 2.5 including the Playstation models retail at $110. The difference between the 2 and the 2.5 are mainly aesthetic and the narrower fit of the latter. As concluded by reviewers, if PG 2 owners enjoy their kicks, the 2.5 surely will not disappoint. Now that the PG 2.5 has been released, the PG 3 is about to make its way to the market. Reviewers hear the sentiments of new buyers if they should cop the PG 3 when they already have the PG 2 and 2.5. For them, there are a few reasons to cop the new shoe model. First is if one is a true Paul George fan. Second is if cash is not a problem. On a side note, the PG 2 is surely on sale by now. To reach his goal, Paul George and Nike basketball footwear designer Tony Hardman agree on three principles in creating his shoes. Shed what is unnecessary. George requested Hardman to make the shoe as light as possible. This plan leads to a quicker shoe that rewards his pool and breathing training. 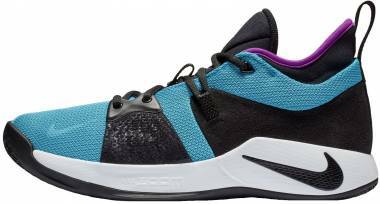 Leaving only the critical features of the PG 3, the extra thermo polyurethane (TPU) has been stripped, the Phylon midsole is softer and lighter, the upper is full-length mesh, and the tongue is integrated to the ankle collar. These changes result to almost an ounce less in weight. Make every step matter. Ditching the forefoot strap for a forefoot wing is another lightweight attribute of the PG 3. A more important role for the wing is while it keeps Paul George secured, it keeps his foot going without worrying of slips. Gone are the lines and waves in the outsole. The circular traction pattern is a welcomed change for the multi-coverage footwork of George. It is expected to have better grip on any surface on any given day. Remember where you came from. Paul George has always been involved in the design process. His love for video games reflected in the previous models in collaboration with Playstation. As for the PG 3, he presents his hometown of Palmdale, California in a NASA-inspired colorway. The zip code 93552 is imprinted on the lateral midsole. In relation to his vision of higher plans, he believes deeply, “Don’t tell me the sky’s the limit when there are footprints on the moon.” The quote is articulately detailed on the shoe’s heel. The circular traction pattern have important digits embedded on them. It includes his birthday, his different jersey numbers throughout his NBA career, and the number of tattoos he has. Aesthetically, the PG 3 has the impression of a PG 2 at first glance. The 3 has the wing design to secure the foot with standard shoe laces. The placement of the Swoosh on the midsole on the lateral is the same in both shoes. For a change, the pull tab is in the tongue of the PG 3. The full-length woven mesh upper of the PG 3 gives wearers a lightweight and breathable construction. Toe drags are welcome as fuse is overlaid at the medial forefoot zone. The inner neoprene sleeve is gone, and the third Paul George basketball shoe simply has the single construction. Heel comfort is relied on the padding in the inner walls. The cushioning of the PG 3 is identically built with the previous models. It comes with a full-length Phylon carrier with a forefoot Zoom unit. However, the Phylon is redesigned to be lesser dense and lighter. This allows the Zoom unit to compress more on the midsole upon landing. This setup also delivers Paul George’s request of a lighter and faster shoe. Every step counts for the OKC Thunder forward. The outsole rubber comes with a uniquely designed circular traction pattern. The grip of this pattern is currently compared to that of the Jordan Why Not Zer0.2. A question arises which model performs better. The PG 3 is set to release on January 26, 2018 and retail starts at $110. How to buy Paul George basketball shoes at discounted rates? As already mentioned, Paul George’s signature releases are really not the most expensive options on the market. In fact, they are among the cheapest in Nike’s signature roster; they can never go near in terms of price to releases such as the Nike Kobe A.D. NXT 360 and other performance shoes in Kobe Bryant’s line. But just because they are already cheap doesn’t really mean that they can’t go any cheaper. The following are just some of the dates or periods to watch out for if you really want to buy Paul George shoes with significant discounts. Release Dates. When signature Paul George basketball shoes are new, everyone just wants to get their hands on them. This, among many other factors, is the reason new releases are priced their maximum. However, prices drop as attention on them starts to wane because newer items have become available. Of course, the loss of interest does not really mean that the product’s quality has also been diminished. It still has the technologies and features that caused all the fanfare during its debut. People will argue that the newer ones are always the better ones; but if your needs are already met by the previous releases, it’s never wrong to just go with them especially if you get them at much lower prices. After all, if we’re talking about performance, being up to date or on trend is totally of lesser importance. Black Friday and the Christmas Rush. Gift-giving during Christmas has become a tradition for many. Although heartily giving away anything is always noble; gifting people with stuff that they can actually use is pretty much appreciated. Because of this, shoes and other clothing items become in-demand during the season. Retailers usually bring their prices down in an effort to catch the buyers’ attention, especially now that competition is everywhere. Anyone who wants to save can take advantage of this. Getting anything for less is not always a simple task, especially if we’re talking about Nike PGs that seem to just get the attention of many. One may have to wait, and waiting can be cumbersome. Those who want to buy Paul George shoes at low rates will have to be ready for this. For sure, the reward in the end will be so worth it. What are the features of the Nike PG 2.5? True to what its name insinuates, the Nike PG 2.5 is indeed similar to the PG2 in form and substance. It has the second Paul George basketball shoes’ cushioning setup, upper construction, and outsole design. What sets its apart from the PG2 is the its midfoot strap, which it conveniently takes after the first signature Paul George shoes. Who is Tony Hardman? Besides Nike PG shoes, what other signature shoes does he have in his portfolio? According to his online profile, Tony Hardman was a student at the University of Wisconsin-Platteville from 1992 to 1994. He went on to become a kid’s footwear designer for Skechers from 2005 until he left the company in 2010. He has been with Nike since then. Working at Nike has always been tough and rewarding. Besides Nike PGs, Tony Hardman has also worked on a lot of other shoes, including some signature sneakers for LeBron James’s collection and Kevin Durant’s line.